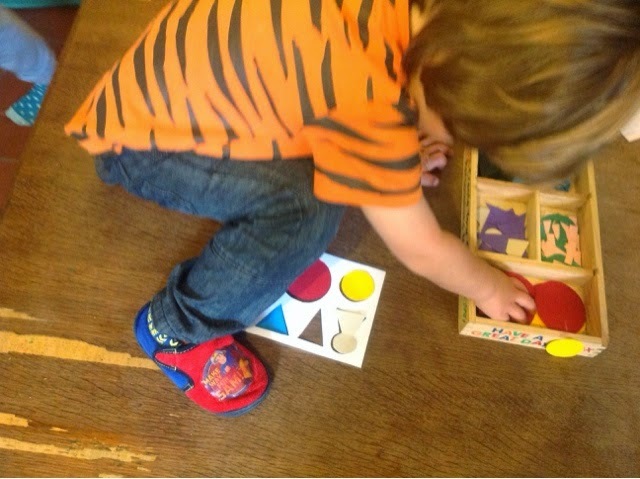 Caring for an animal is always included in a montessori classroom. Usually they start with a fish and take responsibility for feeding it and cleaning it out. We don't have a fish but we do have 2 dogs, 2 rabbits and a hamster in the house. 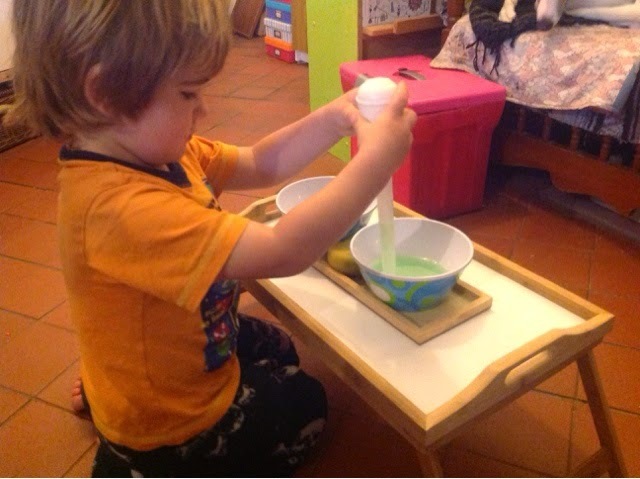 The kids have always been involved in helping to look after them, including feeding, cleaning and loving them! Over the last couple of weeks though, rogue has been so excited about the rabbits. 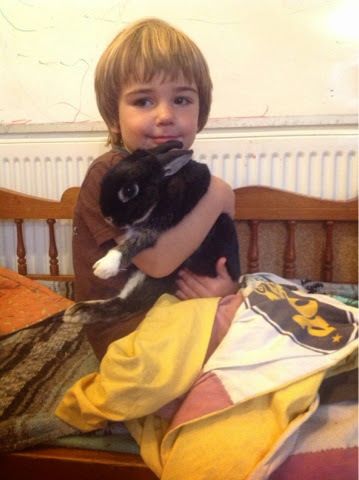 The one he is holding in the picture is called Benjamin Mittens and we have another called Teasel Thumper Cuddles, (all our bunnies have had long names, I really don't know why!). For the last week then it has been his job every morning to give the rabbits their food, check their water and say good morning to them. He is very proud of the responsibility. Binx was working with grammar boxes this week so rogue decided to get involved by climbing right up on the table to examine the grammar symbols. I gave him the large stencil (binx was using the smaller one for her work), and he spent some time matching the symbols to the correct space in the stencil. 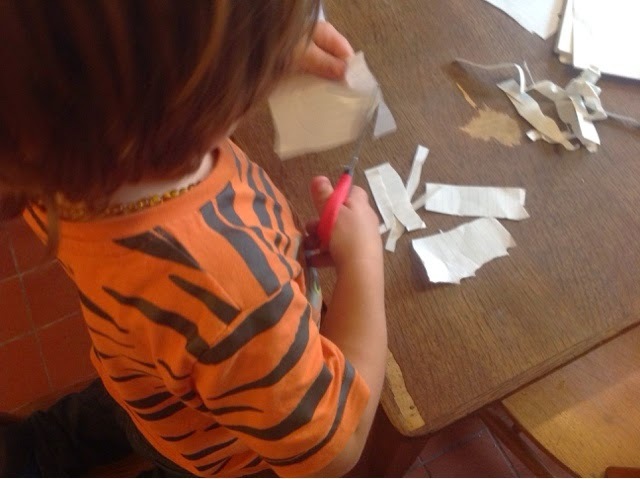 He then wanted to draw some of the shapes using the stencil and cut them out. He is a bit young to draw using the stencil so I had to hold it down for him. His cutting out was pretty good. He drew the shape in the middle and then sheared the edges off gradually until he got close to the lines and then rounded the corners. He is doing the circle below. 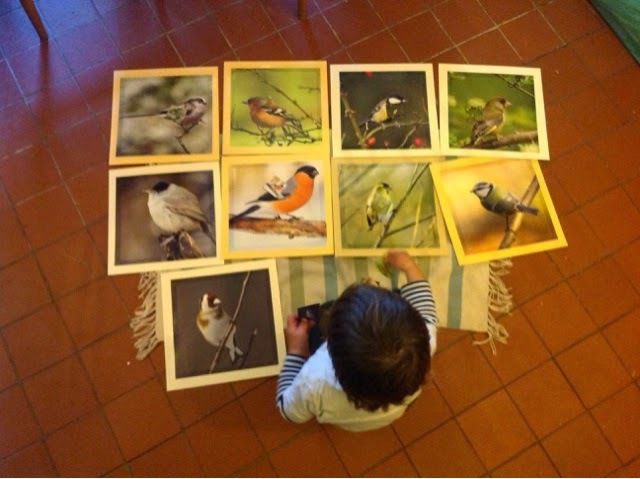 A favourite work that gets used a lot is matching the small pictures to the large pictures. I am going to add 'old calendar' to my montessori materials hunting list right now because I really need to make him a different set of these while he is still enthusiastic about it. The box below was actually sold for holding tea bags but it is perfect for sorting. At the moment it just has a colour on a sticker in each compartment and then craft sticks with the colours on for sorting. I will change this often for different sorting tasks. I'm also thinking if I can find another of these boxes they would be perfect for spindle boxes. I introduced transferring water with a baster this week. A big hit, after he got over the fact that the water was green! Honestly, I thought that would just be a bit of fun, you know, make it a bit more interesting, but while I was trying to show him what to do he just had to keep on (and on) asking, 'why is the water green? ', 'what does green water do? ', 'does green water taste nice? ', 'can the dogs have green water? ', you get the picture! Lesson learned, do not introduce new activity and new colour of water at the same time! My biggest success of the week was the binomial cube. I think I managed to stumble my way into presenting this at just precisely the right moment in his development. He was so impressed by the sides of the box folding down that he let out a little squeak even though he was trying so hard to be really still and quiet to watch. He paid attention the whole time I was showing him and then proceeded to repeat it himself three times in a row just like the presentation. He didn't even try to build a tower which is what he usually does with everything even remotely block shaped. It seemed to be just the right level of challenge without being frustrating and he was so satisfied with folding the sides of the box back up. Isn't it lovely when things just work. 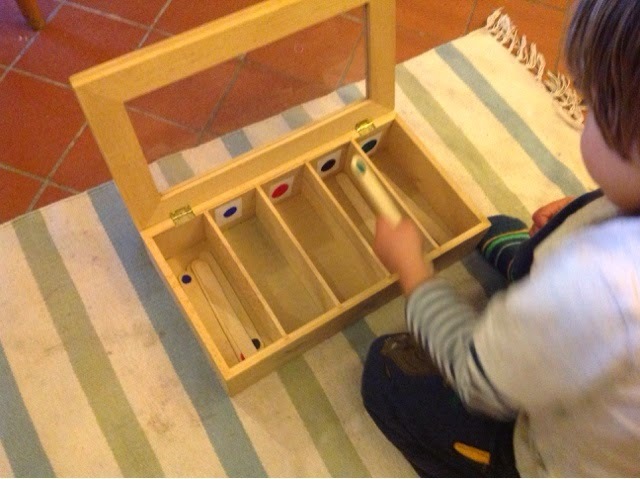 The orderliness of montessori seems to be occurring at other times too. 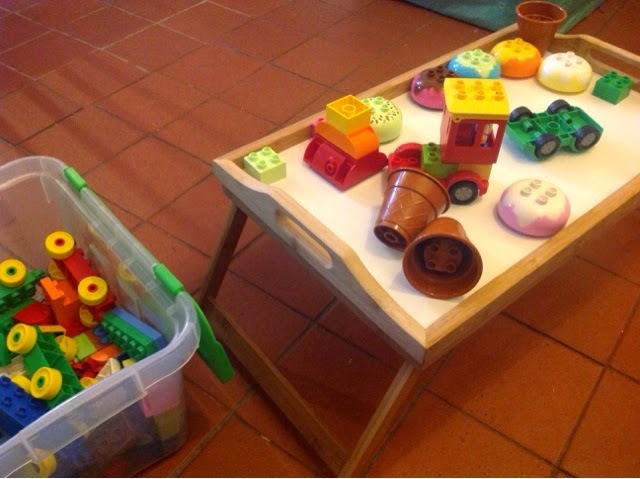 He was getting his duplo bricks out at the weekend and on auto pilot just went to get a tray to put his 'work' on! Anything that keeps the bricks in one place is fine by me! As soon as I saw that tea bag box I immediately thought of spindles! I hope you find another one. 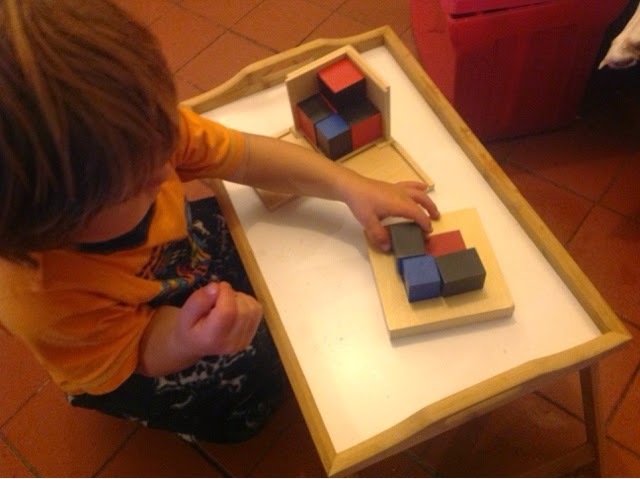 And my DJ loves the hinged box sides on the binomial cube too. Ingenious design!